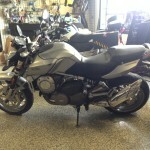 The 2009 Aprilia Mana 850 (Original MSRP: $9,899) is a naked bike that hangs its mechanical bits out in the open. But unlike those bikes, the Mana has a feature you’ll also find in a scooter: an automatic transmission. 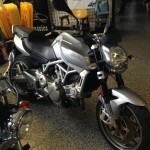 That means is the perfect bike for stop and go city riding. 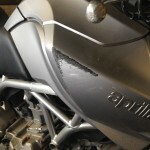 The Aprilia Mana 850 is powered by a fuel-injected, liquid-cooled, 839 cc V-twin engine that produces 76 horsepower and 8,000 rpm, routing exhaust gases through a two-into-one stainless steel exhaust system. The fully automatic gearbox is a CVT (continuously variable transmission) that can be overridden in manual mode. What? Let me explain. There are the myriad shifting options, selected via a button on the right grip: you get three automatic modes (Touring, Sport, and Rain), and Sport Manual. In any of the auto modes, the Mana feels almost like a power scooter trapped in the body of a motorcycle (and it sounds like one, too.) In either auto or manual modes you can push a left grip-mounted shifter button (or depress the “shift lever” at your feet) to downshift, but once you “upshift” in auto mode it goes back into automatic. Additional features? The false fuel tank lifts to reveal a storage bin big enough for a full-face helmet, and a parking brake operates with a hinged lever. 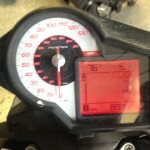 The bike only has 899 miles on it and has been serviced by us here at Modern Classics DC. This thing is road ready. 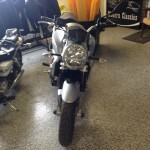 With that said the bike has a few minor cosmetic issues, as it’s been down twice (once on each side). Yeah for symmetry! Photos are available below. 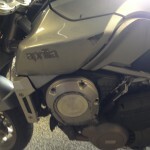 The price reflects the damage – but mechanically the bike is really sound. Not sold on it? Come check it out today!